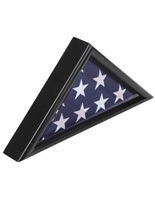 These black flag pedestals are made to elevate military banner display cases. The stands are made of pine and feature a lightweight hollow body. 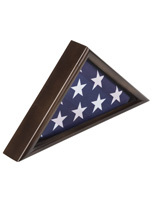 The flag pedestals have a simple design that doesn't distract from the ensign display case. These stands have a wood grain finish and are also available in cherry and oak. 19.6" x 2.6" x 4.8"